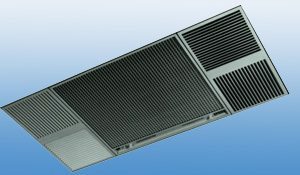 The X-11Q cigarette smoke filter is designed to fit inconspicuously into a drop ceiling, replacing a 2′ x 4′ ceiling tile. The X-11Q filters smoke, dust, pollen and many other irritants with up to 99.8% efficiency without the need to replace filters. Designed with the user in mind, the 3 speed fan found on this air cleaner quietly and efficiently cleans an area using the Coanda airflow pattern. And our equipment is built with high grade components like industrial cells instead of residential cells. These are the same components from our industrial product line used for welding smoke and CNC machining. Here’s a parts list for all our air cleaners designed to remove tobacco smoke from the air. Learn how you can efficiently bring clean air to your workplace.